It’s not just researching the ideas, there’s often preparation involved, potentially craft supplies to be bought and all this on top of every day life. Much as I hope this blog cuts out some of that research work for you and inspires you to have a go, I have to say our family goes through seasons of overwhelm too and it’s harder to have time just to think now I’m back in a paid job. This is exactly why you might find The Treasure Box People an awesome resource. Getting post is always so fun! Imagine getting a parcel through your door (what kid doesn’t like getting things in the post?!?) 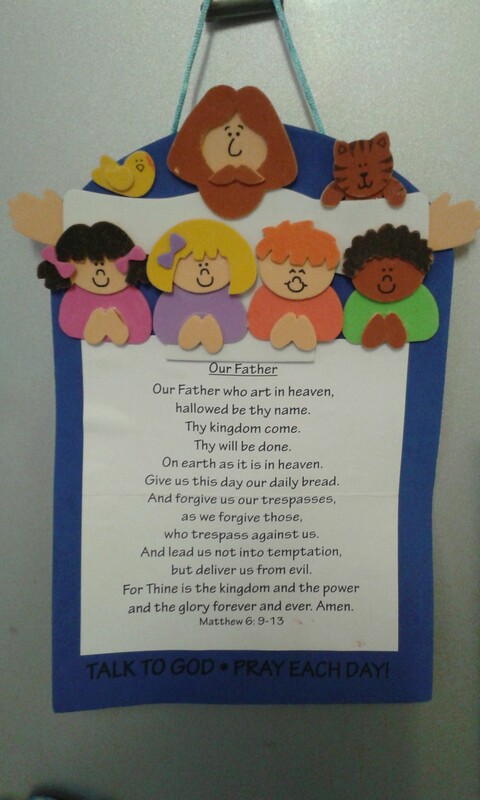 with 4-5 crafts and activities related to a bible story (storybook included) that you can just start there and then. No research, no trip to Hobbycraft, no whining children while you set up, just a couple of evenings worth of activities for you and your little ones. It’s no surprise that when Ian and Becky May set up their kickstarter in the autumn of 2014, people soon saw the genius of this idea and its huge value for families. And thus The Treasure Box People was born. It always starts with a story. 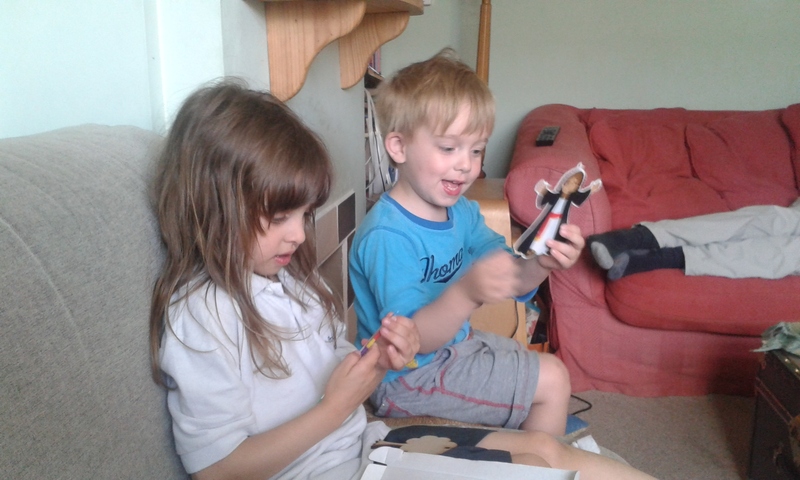 We love the Joseph story so this particular box was a hit. We’ve now had three Treasure Boxes sent to us so far. What I love is that although all of the activities involve making something, decorating something or even planting something, this is far more than a craft box as you can then interact with each item and continue to use it over the next few weeks and months. When we got our first treasure box, I have to admit I was a little sceptical. The cost was £10 (you get a discount if you order 6 months or 12 months at once so it’s a great present idea for grandchildren or godchildren) and, as I looked at the box it seemed awfully small to contain much of interest. If you’ve had a Graze box subscription and then calculated how much you paid for each chocolate covered raisin your child ground into the carpet, you’ll understand my cynicism! However, I was soon proved very wrong. Our first box was on the theme of prayer and, as I totted up the cost of the materials and worked out how much time it would have taken me to pull the 5 activities together, I realised it was extremely good value for money. And my kids loved it! Our treasured prayer banner, now on the fridge! It was like having this blog in a box! My kids, aged 3 and 6, were really invested as they love getting post and there was an added cache to receiving a ‘kit’ rather than something Mummy had put together. 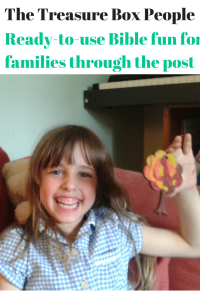 My daughter and husband particularly loved putting together this mini banner which we now have on the fridge and really enjoyed their focused together time. 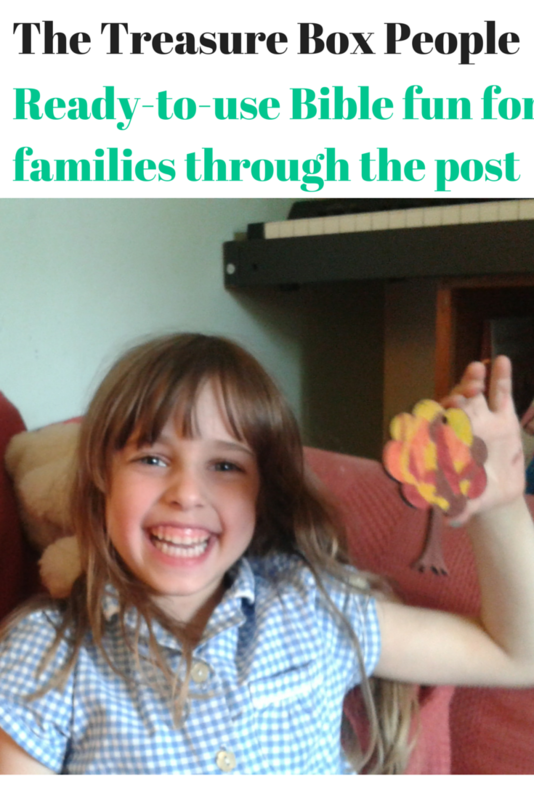 There were several prayer activity ideas, all of which got us praying together as a family in new and creative ways. Our latest box was on the theme of Joseph as the boxes are now going through the major stories of the bible. My kids love the musical “Joseph and the Technicolour Dreamcoat” so know this story well and were very enthusiastic to get going. First we read the small story book which came with the box which presented the story well for the 4-8 age-group. 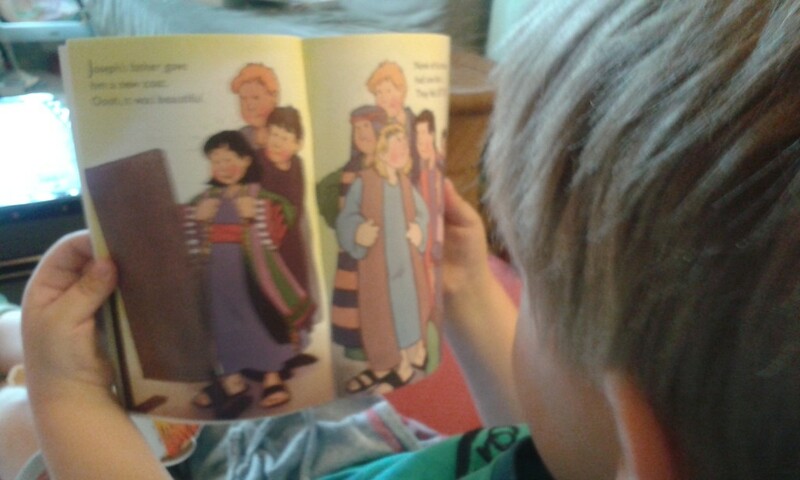 I liked that the book (which was published by Candle) moved a bit beyond the bare bones of the story and looked at Joseph’s feelings and God’s hand in the story. 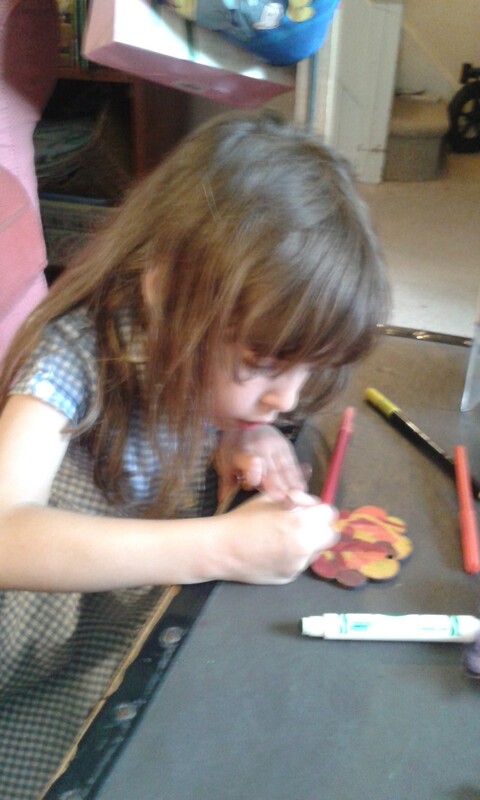 My daughter (6) then went on to make the family tree hanger with minimal help and my son (3) enjoyed the scratch art Joseph figure. I liked that a range of skill levels were catered for. 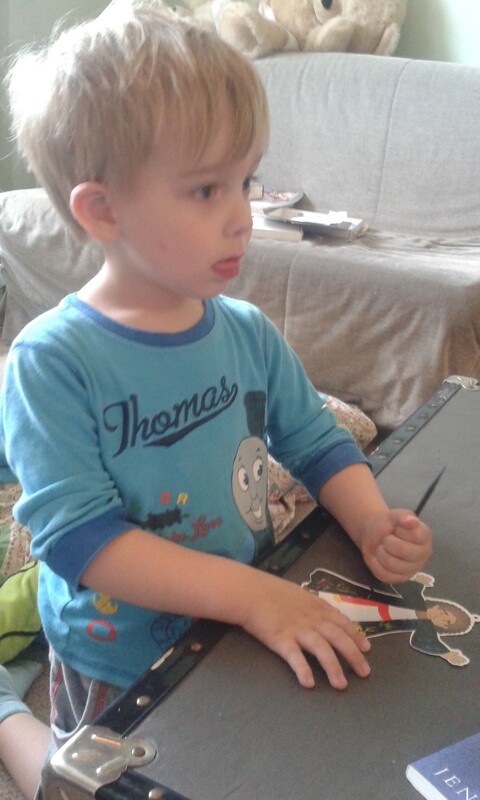 The boxes are designed for ages 5-8 but my son is a dexterous almost 4 year old so there was plenty for him to do. 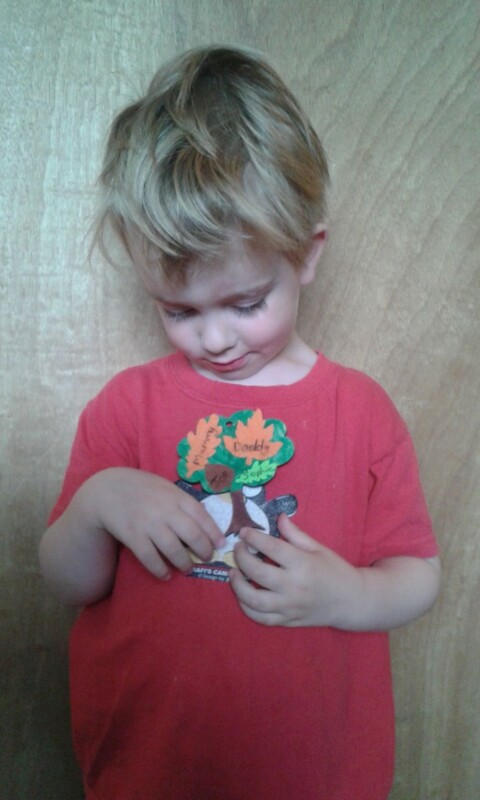 There was also a pendant for some bible-story bunting to colour in (you can download the pendants from previous stories if you missed those boxes) and then a fun sock puppet of a camel who we used to help us retell the story again. Overall, there was about an hour and a half’s worth of making activities in this particular box but we spread it over 2-3 evenings. Most of all it gave us as parents valuable time with our children focused on the bible and enjoying each others company, all with zero set-up time or stress. Although they do this kind of thing in Sunday school, there is no substitute for them seeing that the bible matters to us and that we want it to matter to them. Having had 3 boxes now bought individually, I am planning on subscribing. Now I’m working, pulling this type of activity together is a step harder and these little boxes have come at a great time for us. We’ll still do our own family activities for instance at Easter but these make a great addition outside the major holidays when my creativity and enthusiasm are at a lower ebb. In general, the quality of the craft materials is very good and it’s amazing what they pack into that little box. I also think that, although discussion ideas are suggested, these bible activities for families would be good for a range of denominations and theological traditions as the materials are not too directive. Occasionally we have found that the instructions for a craft are not as clear as they could be but the materials are bought from a number of different suppliers so that is probably not surprising. As intelligent adults we’ve always been able to figure out a workaround. The materials are always complete and come well-protected in their box. So do go check out the website at http://www.thetreasureboxpeople.co.uk/ and let me know how you get on. Disclosure: My 3rd box was in fact sent to me free-of-charge as a review product but I was not instructed on what to write and all opinions are my own. (In fact, I was going to write in praise of Treasure Boxes anyway this month!) I heartily endorse this worthwhile company and plan on reordering repeatedly.